The Archdiocese of New York posted this video from the Discovery Channel showing a few of the techniques used for cleaning stone as part of the St Patrick Cathedral restoration project. For further in formation on the restoration effort, visit the cathedral's website. There are a few other videos there as well. My wife and I were discussing geometric church plans the other day. 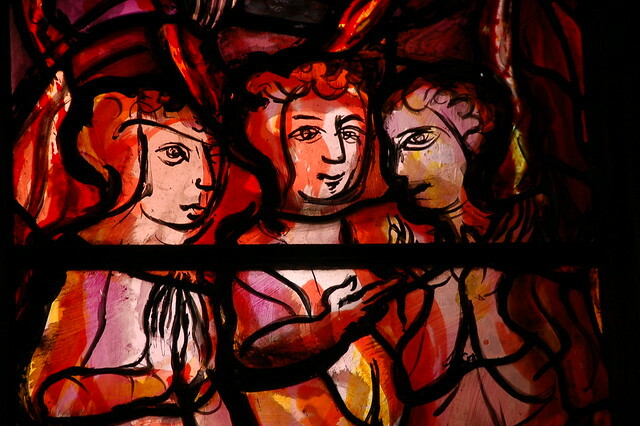 Looking through a wide range of shapes, she asked, "Why are there no triangular churches?" My first thought was, of course there are. I swore I'd seen many; I've seen just about everything else. But then I tried to name one. I was stumped. Triangles are such brilliant structural forms. They show up in section all over the place. I wrote a post discussing the tent-form or a-frame that was immensely popular in the US in the 1960s and 1970s that is simply a triangle in section. 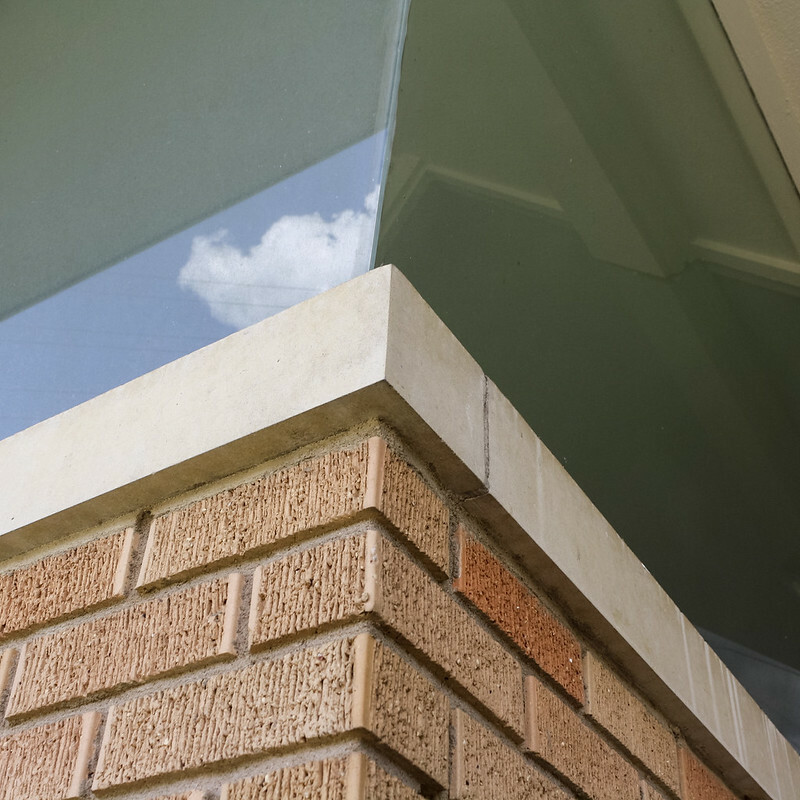 There are plenty of examples of structural elements, roofs, etc. But what about plans? 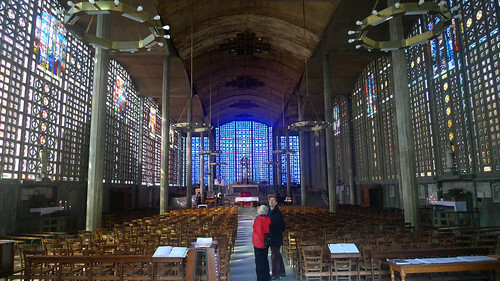 Plans were an obsession with church architects in the 20th century, especially 1940s-1960s in Germany. 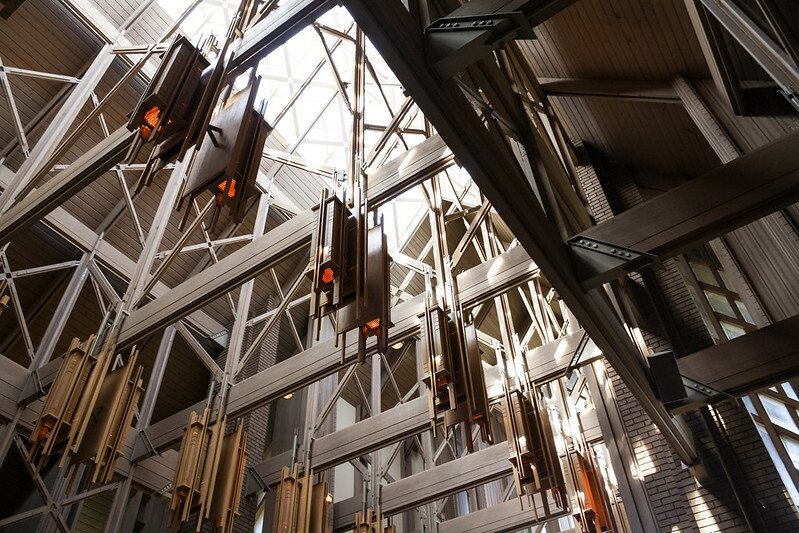 Architecturally, it was an incredibly dramatic formal move to modify the plan of a church. Liturgically, it was seen as a clear way to intentionally modify the arrangement of the different participants and objects in the liturgy to express the desired relationships between them. I suspect the fascination with plans also had to do with the iconic nature of The Church Incarnate and improved technology making it easier to reproduce plans in books. So I went looking in a few of my go-to plan-happy books. There are of course no shortage of wedge-shaped plans following on radial auditorium arrangements. But we're looking for equilateral triangles. I found a number of interesting plans constructed from compositions of triangles or tripartite in various ways. Here is the plan of the Evangelical Church of the Resurrection, Rottach-Egern, Germany from 1954. But take a look at the satellite photo. That triangle is a construction tool only and has little to do with the spatial form of the building. Not sure what the triangular object in the center is, either. There are also plenty of modified triangles. Here is an unbuilt design based on an equilateral triangle with its vertices truncated. Or you could describe it as an equiangular hexagon with unequal lengths. But given the triangular sanctuary plinth and three seating sections, I'd call it triangular. But all of that is an aside when we consider what the Reuleaux triangle might mean for architecture given that the church does not rotate. The most significant property is in its construction from polygonal and circular components. The most compelling church are in some way hybrids of complementary—if not contradicting—concepts that invoke and then challenge familiarity. Scripture does this, the liturgy does this, and any sufficiently developed theology does this. The synthesis of angular and circular profiles in plan is on the simple side. 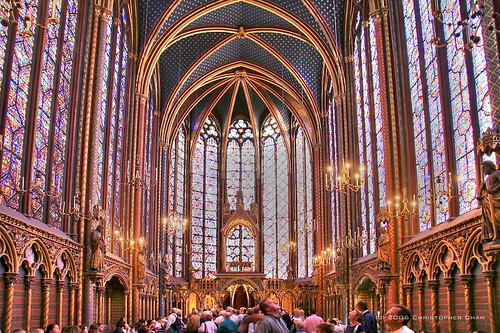 Of course, an elegant plan is a necessary but insufficient criteria for a good building and for an effective liturgical arrangement. But it does appear to have deeper implications. For one, it provides the radial seating without sacrificing a grand, dominant sanctuary and focal wall. The auditorium-derived radial seating concept has benefits for lines of sight, audibility, and proximity, but those often come at the cost of a smaller sanctuary tucked in a corner. Rotate the arrangement 60º and it is closer to the typical radial arrangement. Which is not to say this could not also work, and the curved segments of the Releaux triangle lend a more gracious openness compared to the angular example in Rottach-Egern. But the additional seats needed to make up what I deleted end up further from the altar. 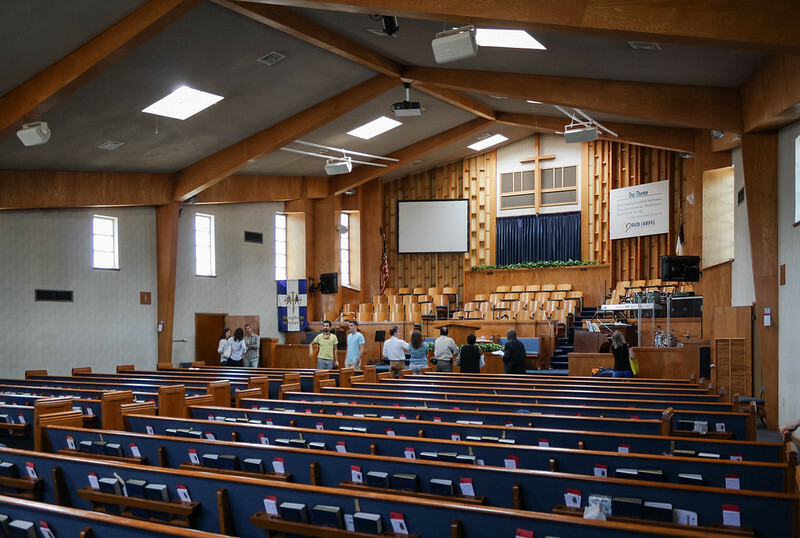 As designed it, it puts the width where it is most needed to put the greatest part of the congregation near to the sanctuary. The comparison of these two versions reveals another contrast in the orientation and directionality created by this shape. In either configuration it acts as a circle with a pointed axis—a clever synthesis of Schwarz's first two plans plus a bit of the typically-parabolic "dark chalice." The corner sanctuary has a stronger "militant" directionality from the image of a ship's prow (prora navis... and we've come back around to the nave). The original has a potential for greater subtlety in its axis. The forward movement could be more of a forward embrace coming from the bi-directionality of point and line. I say could be, because to make these images effective relies ultimately on their spatial projection. 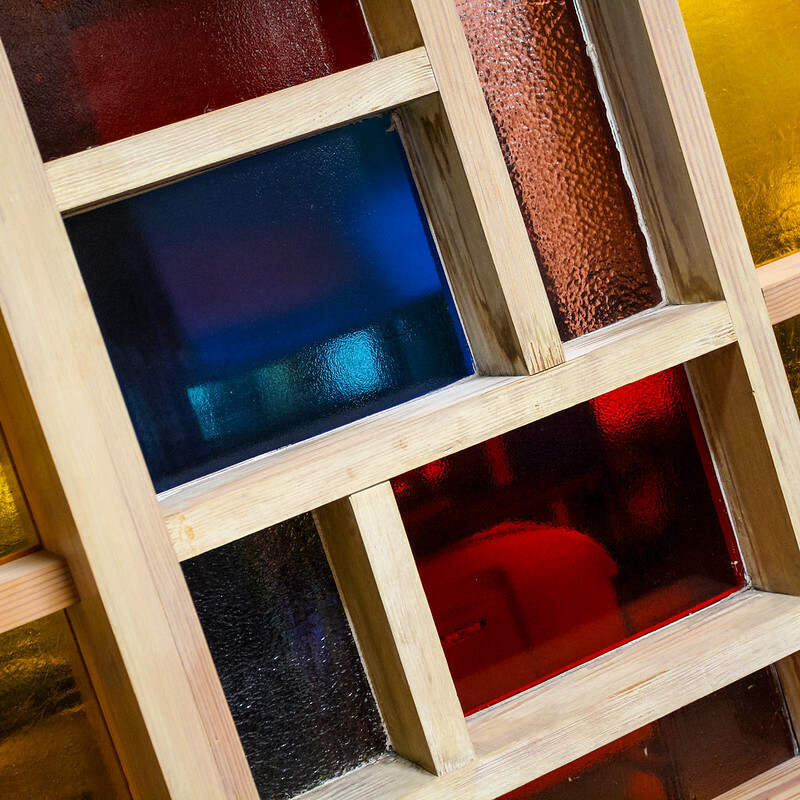 Without direct experience, or at least interior photographs, it is impossible to comment on that component. Again, here is the danger of fixating on plan. Even if we argue that the plan contains the more fundamental truth of the arrangement, it is not the more immediately experienced. There is something we can say generally about the Reuleaux triangle's projection into three dimensions. 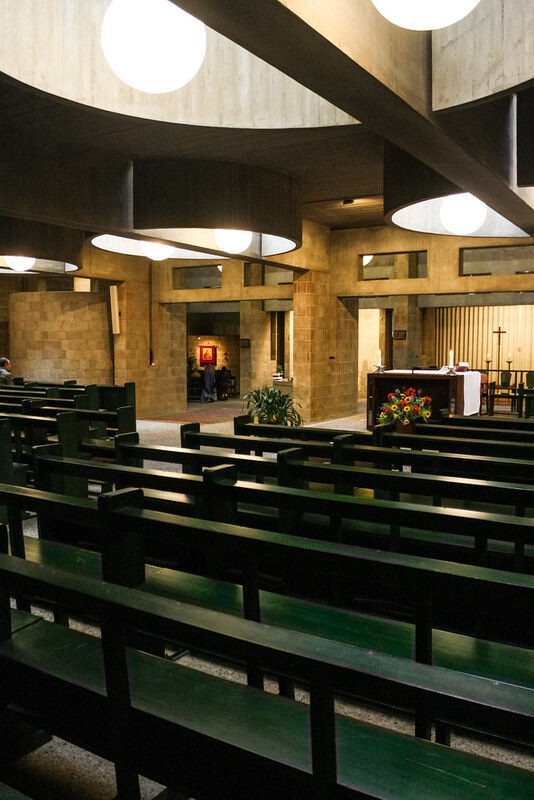 The idea of being both angular and circular gives the corners an unexpected smoothness without losing the sharp definition, an appropriate gesture for a church interior. A slight variation on this theme would to round the corners to create three parabolas, borrowing from that spatial indeterminacy in each corner. That appears to be the case with Kuratie Heilig Geist (Holy Spirit), Würzburg. The Reuleaux triangle is a fascinating potential shape for a church that allows the plan to take on the advantages of a number of other arrangements. I would like to see more examples of its use. And if you know of any equilateral triangle plans, please share them in the comments. Two church buildings with triangular plans came up recently on one of my favorite tumblrs, Architecture of Doom. Two technological revolutions shaped Modern architecture during the 20th century: The Industrial Revolution and the Digital Revolution. 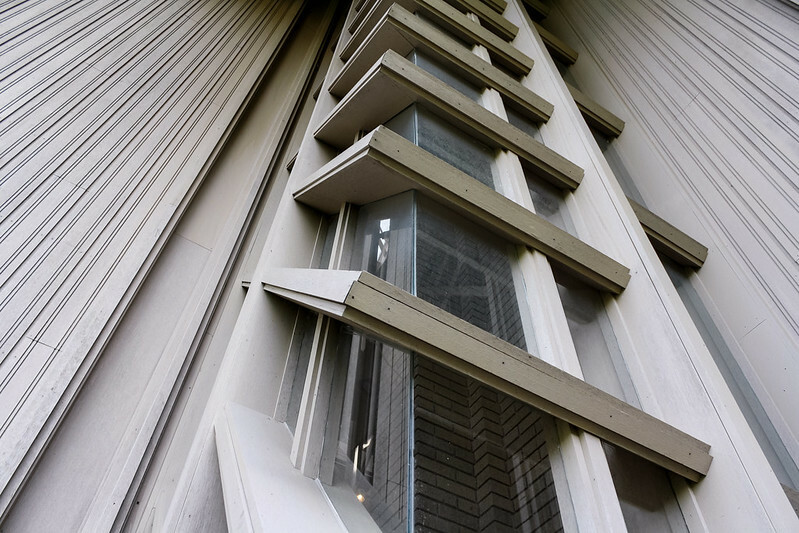 Each in turn transformed every aspect of conceiving, designing, building and occupying buildings. The first introduced Utopian visions; the second opened up seemingly unlimited possibilities for creative forms and efficient construction. Building design always reflects changes in society. This seminar will examine how those changes are reflected in our architecture along with the evolution of drawing, thinking and communicating. It was a wonderful experience. The seminar was very well received, and the membership was engaged and delightful. I realized this would be an excellent environment to test out a seminar I have sketched out a few times—my version of a history of church architecture that emphasizes complexity and continuity while challenging some of the oft-repeated and emotionally charged inaccuracies that tend to govern popular discussions on the subject. 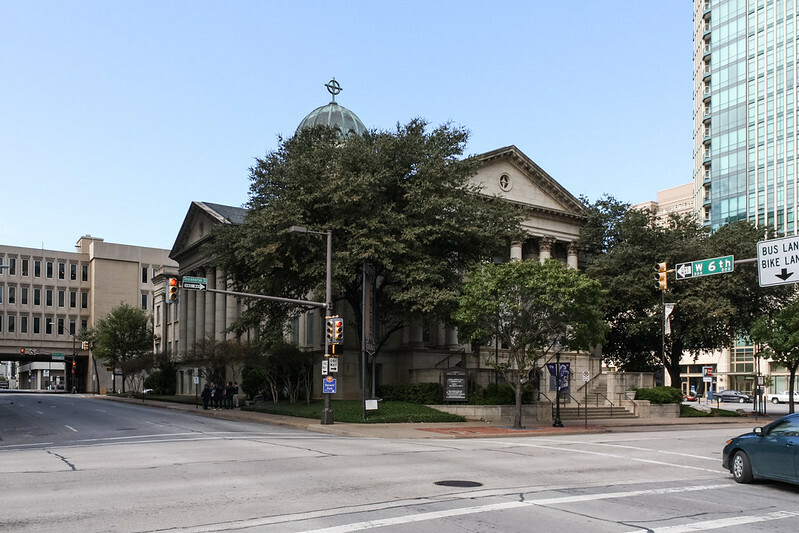 And so, the UT FORUM committee has accepted a proposal for a seminar on church architecture. The outline submitted as the proposal is included below. Each of the six sessions comprises 6-8 brief essays, one of which addresses a "Topic in Theological Aesthetics" pertinent to the time period covered. Frequent readers on the subject will not doubt recognize some of the titles as borrowed from some of the seminal books on the topic. You will note that time does not pass uniformly; the first two cover ~500 years, the middle two ~1200, and the final two ~300. This is an intentional focus on the development of concepts significant to recent history rather than a cascade of visual languages, and also because most histories of western art and architecture tend to focus more on the religious work of 500-1700. 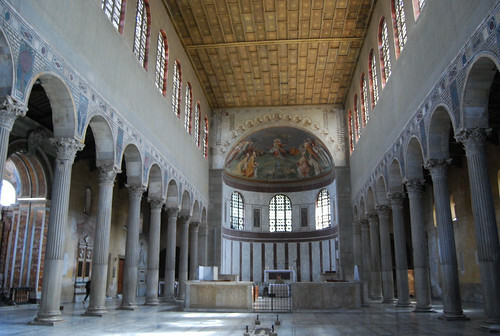 (I may be the only who views the Renaissance as a low point in church architecture.) And so each session will also include later interpretations of what developed in each period. We will view history through the specific lens of a post-post-conciliar hermeneutic of continuity. This outline is a proposal, so it will change as I develop the course. And expect many of these essays to appear on the blog as I develop them, especially those noted as "Topics in Theological Aesthetics." Once complete, the seminar will also be available to be presented to other groups. It would work well (with a few modifications) for an adult religious education series. 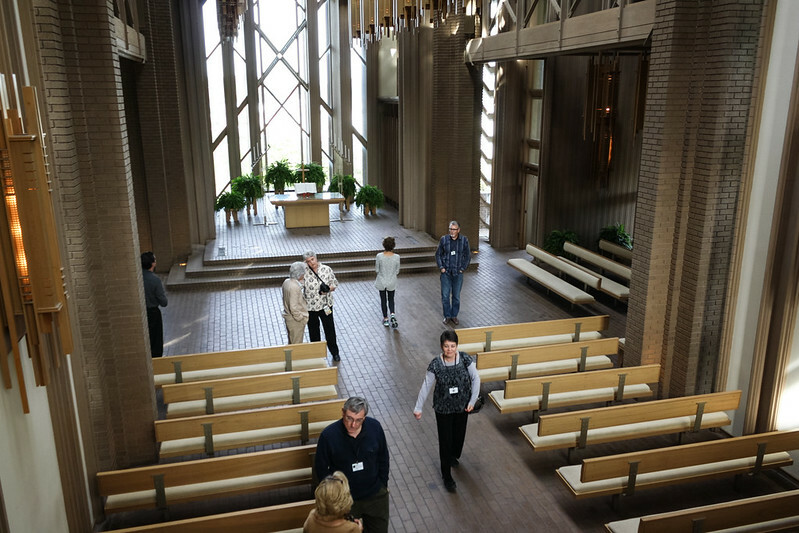 In that context, the final session could be a tour of the congregation's own building in which we discuss how the precedents and concepts from the course influence their own space. It could also easily be expanded into a seminary course. If you know of an organization that would be interested in such a seminar, please contact me at locusiste.org@gmail.com. 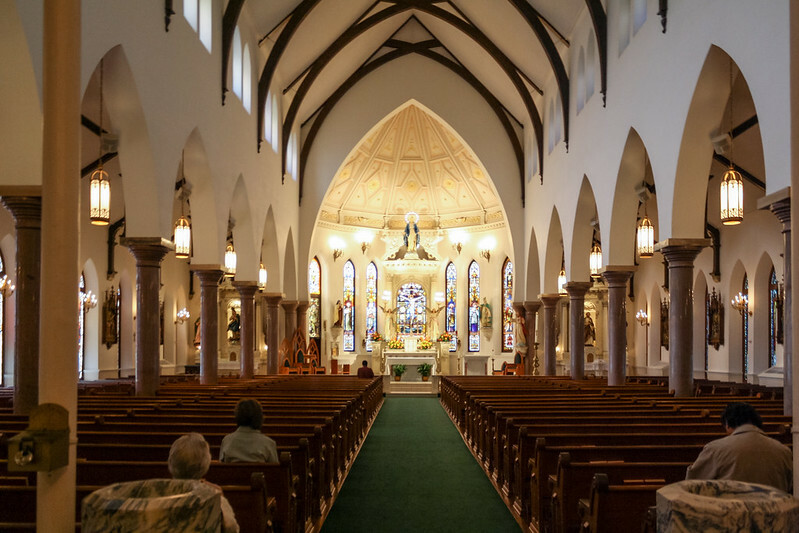 The story of church architecture is the story of the church's myriad attempts at the impossible task of making physical the realties of her identity as the Body of Christ. This seminar examines the conceptual foundation of sacred place before exploring the diversity of forms used in their creation and concluding with a discussion of what we should do with them now. Although arranged chronologically, this is not a history but a continuity: it looks forward from each historical moment to examine how different churches adopted and adapted these concepts, forms or actions up to our own time. 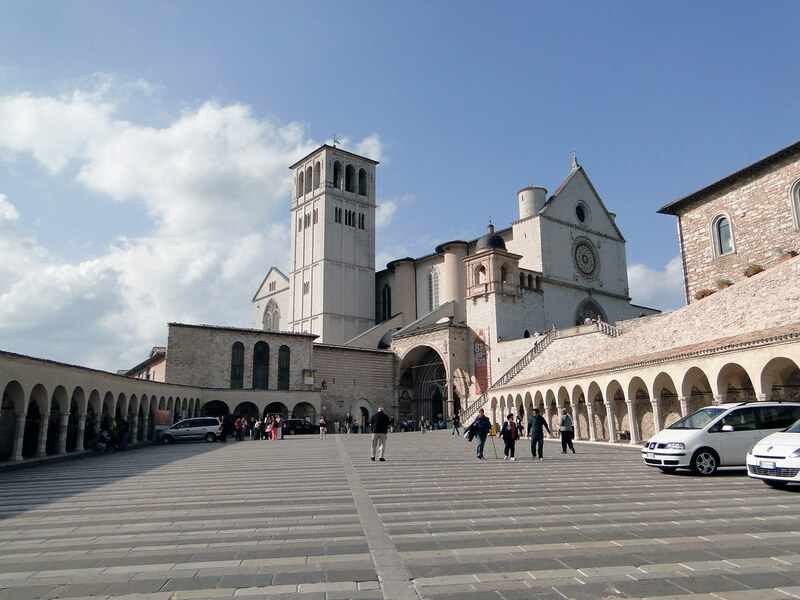 This approach begins from the perspective of liturgical practice—the service of the people—and its spatial implications rather than the historical progression of artistic styles. In addition to tracing the development of Christian worship, each lecture also includes a discussion of relevant topics in the field of theological aesthetics. Continuity, Complexity, and Contradiction (1962–) 1. The pre-conciliar liturgical movement 2. The post-conciliar liturgical movement 3. Dom Hans van der Laan: Form-play of the Liturgy 4. 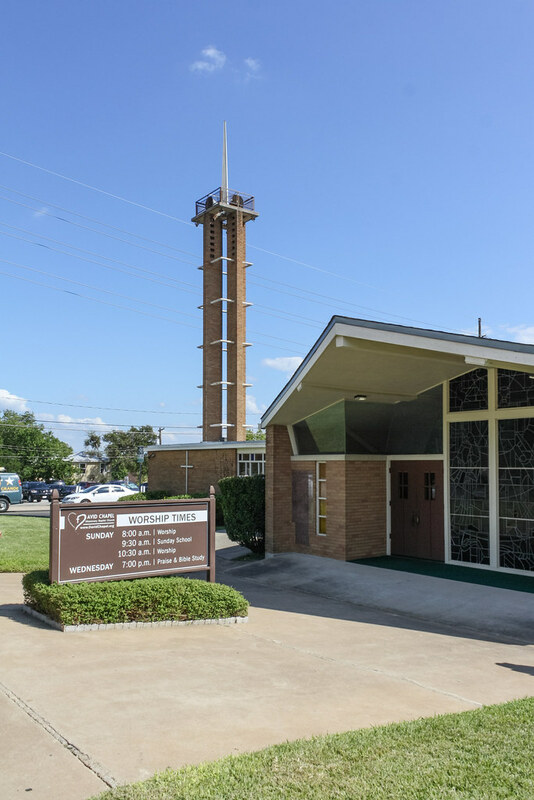 Mid-century Modern Church Architecture 5. Topics in Theological Aesthetics: Imagination & Beauty 6. Recent developments in church architecture 7. How now should we build? 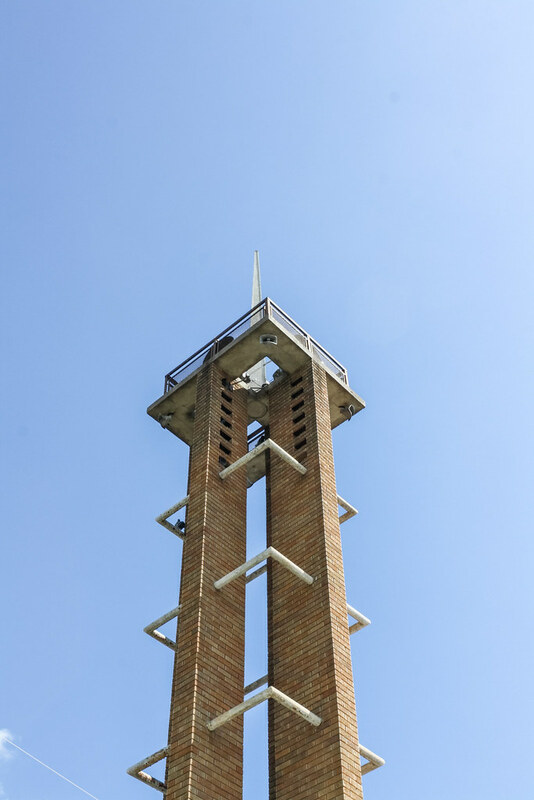 The National Churches Trust, along with the 20th Century Society and the Ecclesiastical Architects and Surveyors Association held a competition last year (2013) to name the best modern churches in the UK. The criteria for modern was that they opened after 1 January 1953. The top honor went to St Paul, Bow Common—previously featured here and here and in this flickr set and again in this one, and the subject of my master's thesis. So needless to say it is a favorite. 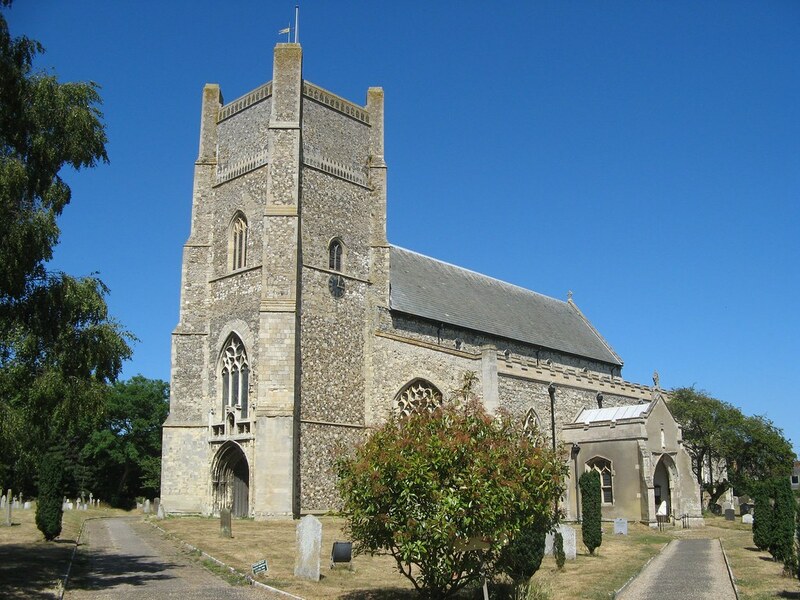 As part of the competition, the National Churches Trust released a video profile of the church that really helps describe the experience of the space. The potency of the space does not translate well in photographs alone due to its raw appearance, so the movement and light possible in video help. And you have a wonderful guide for the video tour: Prebendary Duncan Ross, who has been an incredible pastor for the neighborhood and steward of the building. I believe his efficacy comes in large part because he understands how those two are related, especially when you have a building of such personality as a partner. 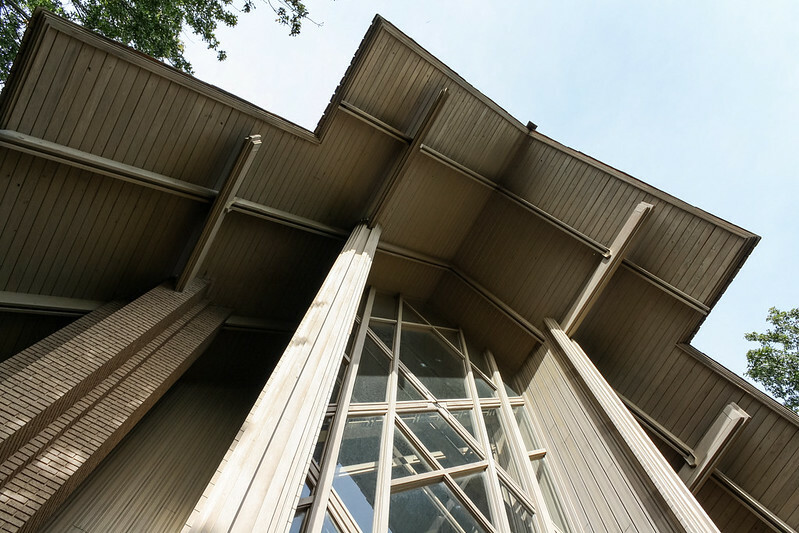 The UK's Best Modern Churches: St Paul's Bow Common from National Churches Trust on Vimeo. Here is the full top 10, which you can see illustrated on bestmodernchurches.org.uk or the Architects Journal. 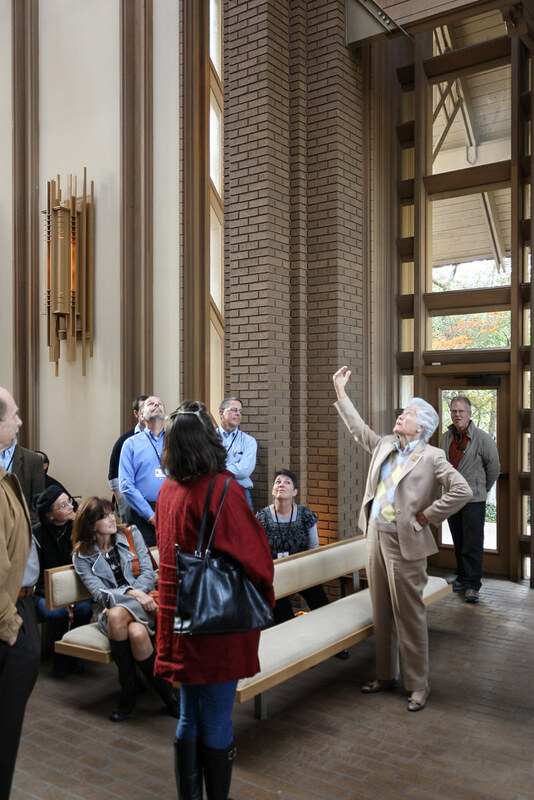 One of the special events of the 2013 Texas Architects Convention in Fort Worth was a tour of three small chapels led by James Nader, FAIA. 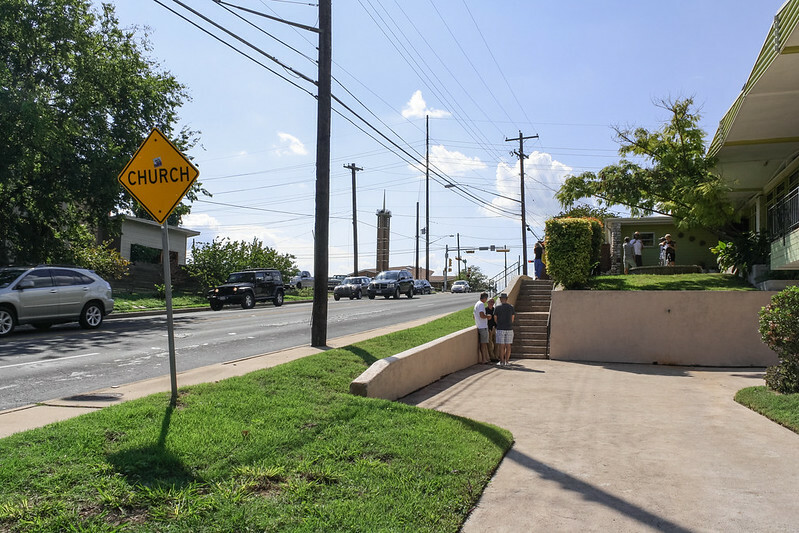 The tour was presented by the Texas Office of Partners for Sacred Places, a national non-profit whose purpose is the preservation of historic church facilities. 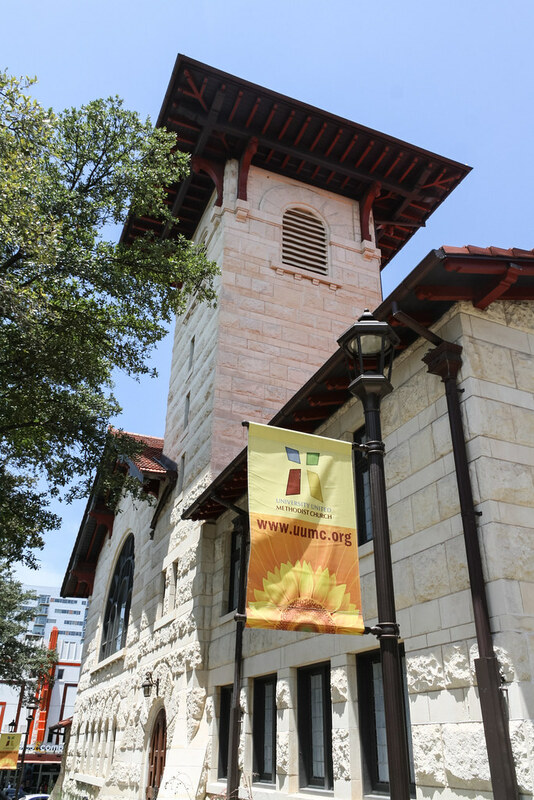 What is unique about their mission is that they treat preservation as one aspect of ensuring the vitality of the historic church community who calls the building home. They are the "only national advocate for the sound stewardship and active community use of America’s older religious properties." 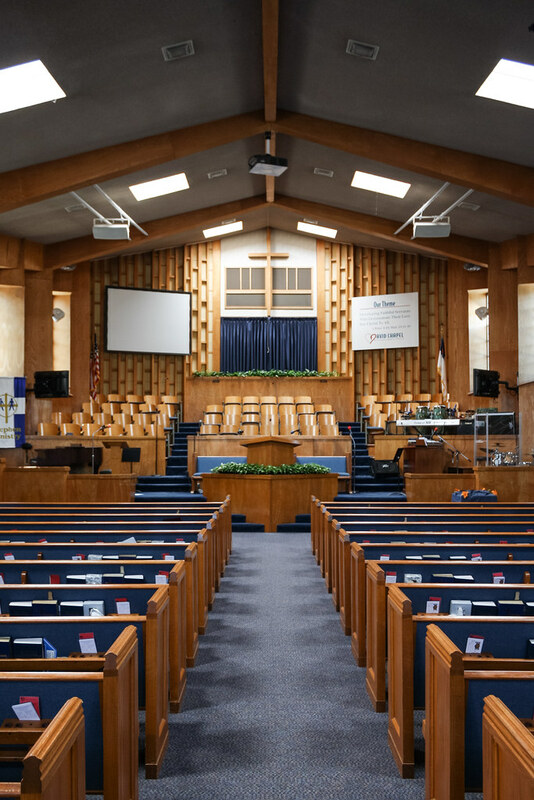 The Texas Office also just announced the launch of the Texas Sacred Places Project website with the goal of creating an inventory of purpose-built religious buildings designed for worship and more than 50 years old. This looks like a wonderful project and I look forward to exploring it and contributing. Photos and some thoughts on each of the churches follow bellow. 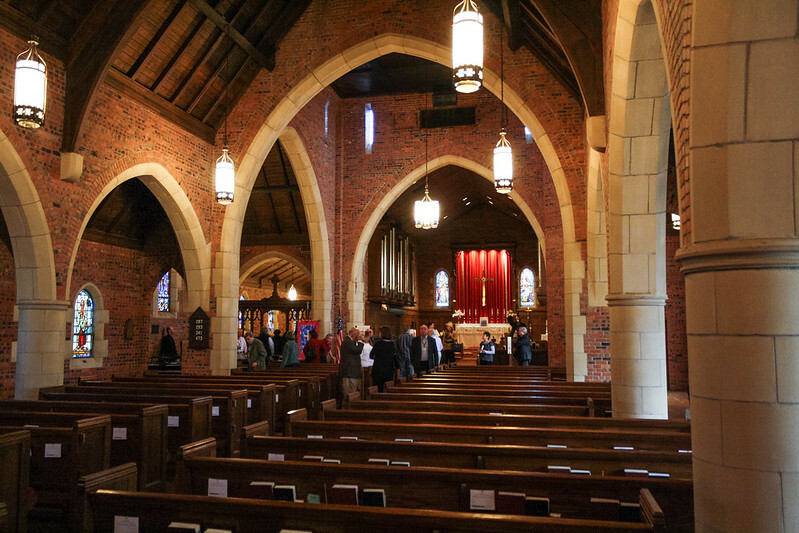 The first stop on the tour was a "diminutive" English Gothic chapel built in 1966. Architect and church member Joseph J Paterson proportioned and detailed every aspect of this chapel for use by children. Note the use of "reject" clinker to accent the rustic character. The exaggerated thickness of the walls contribute to the somber weight of the building. 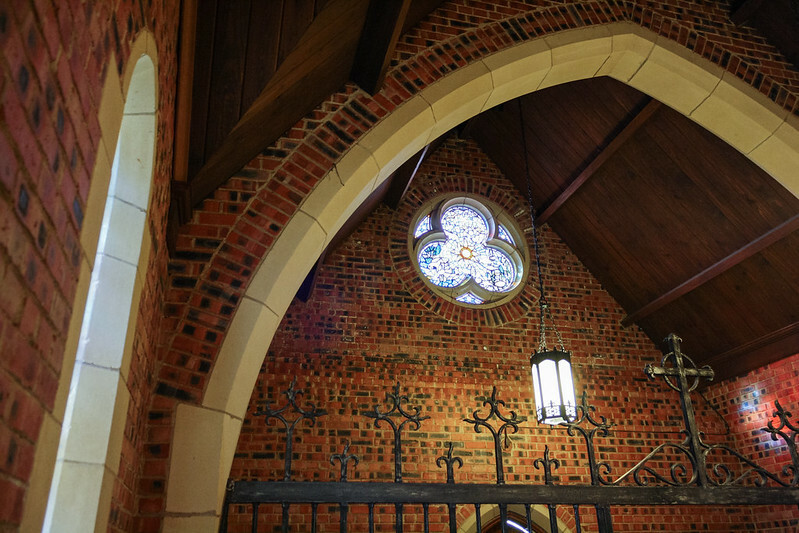 Above the door of the chapel, inverse corbeling lightens the wall on the interior as it rises to the small rose window above. As an adult, the chapel feels like trying to play a 3/4 size instrument. 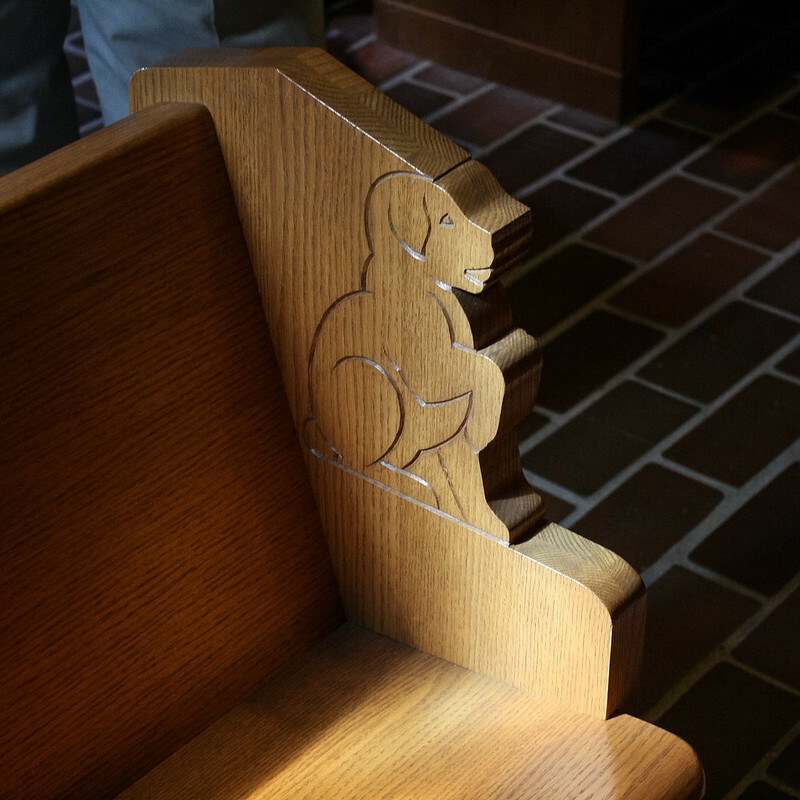 The windows, pews, and other furnishings feature animal figures and depictions of the childhood of Jesus. 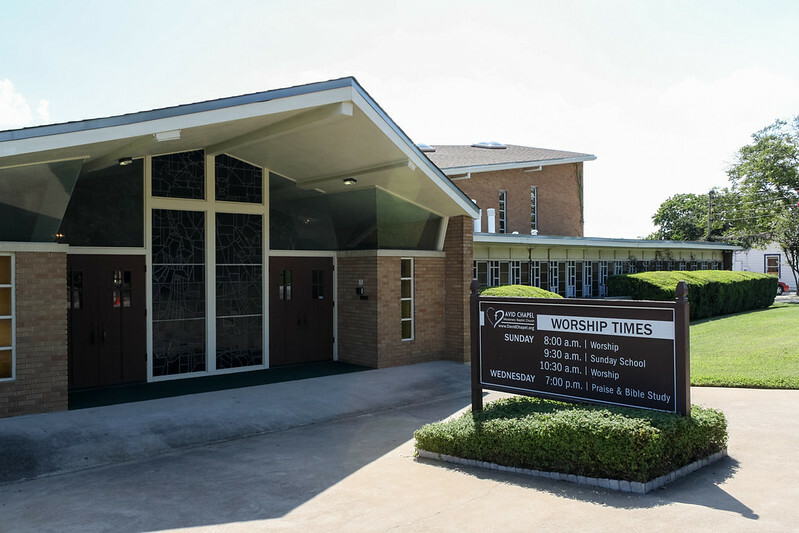 The Dorothea Children's Chapel was an addition to the main church which was also designed by Paterson and built in 1952. Paterson modeled the church on his studies of Gothic parish churches found on his travels in England. 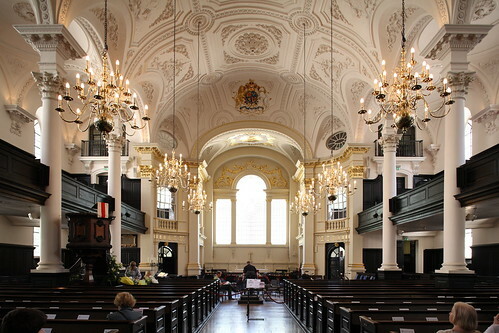 A few characteristically Anglican features show this influence, most notably the full chancel with quire. The chancel is missing a rood screen, but the lady chapel terminating the left aisle does have one. A metal rood screen also separates the Children's Chapel from its narthex (above). The squat central tower is another common feature of Victorian Gothic churches. View the complete photo set of The Dorothea Children's Chapel and St John Episcopal on flickr. The centerpiece of the tour was an interfaith chapel at the Lena Pope Home, which opened in 1930 as a home for orphans. 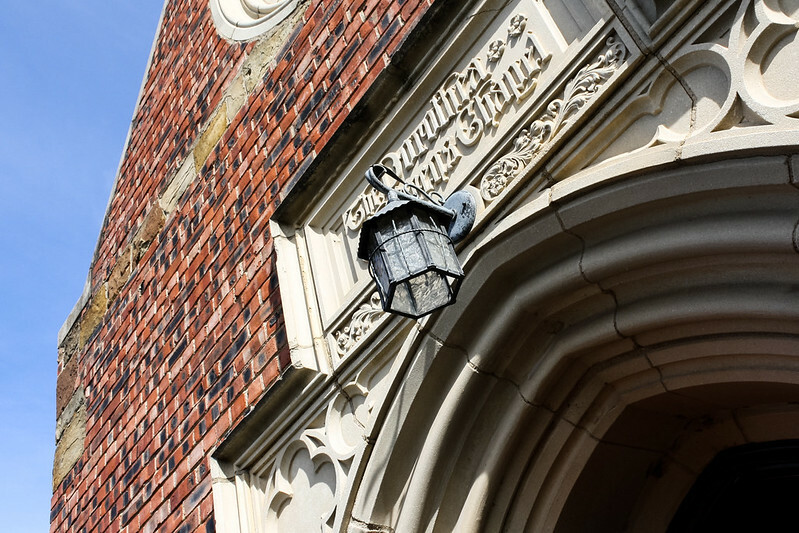 The Home still housed disadvantaged children at the time of the chapel's construction (1990), but its mission has since changed to focus on enabling families to stay together through counseling, a charter school, and other educational programs. The chapel has remained in constant use by the Home and the community it supports (plus lots of weddings). 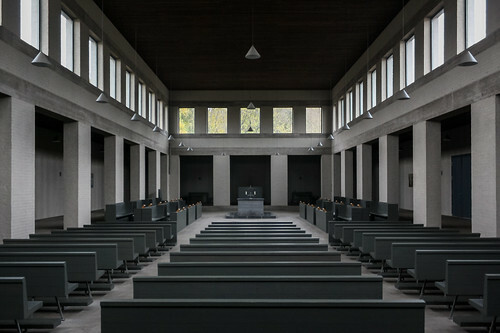 The purpose of the chapel was similar to the Austin State Supported Living Center Chapel previously featured on Locus Iste. 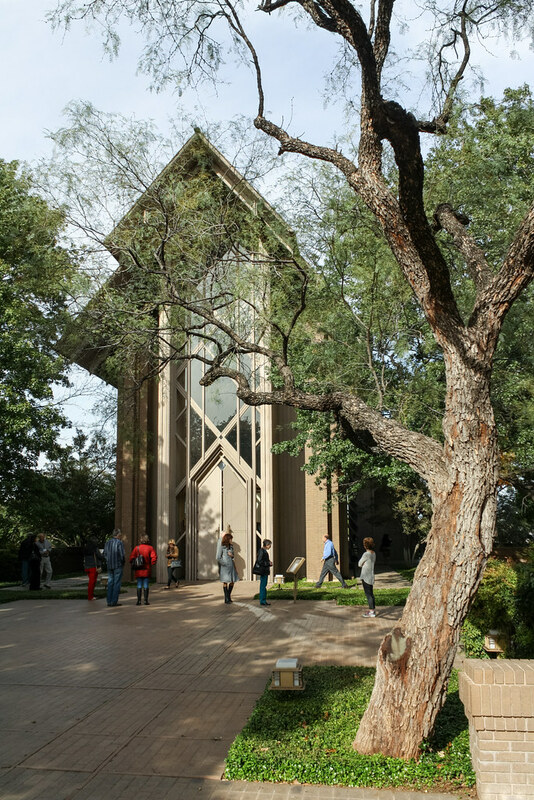 The Marty Leonard Community Chapel provides a serene setting where the youth of Lena Pope Home can give and receive acceptance and forgiveness, develop character, understand the unexplainable, accept the unacceptable, forgive the unforgivable, develop and refine a moral values system, and seek peace and a new beginning. 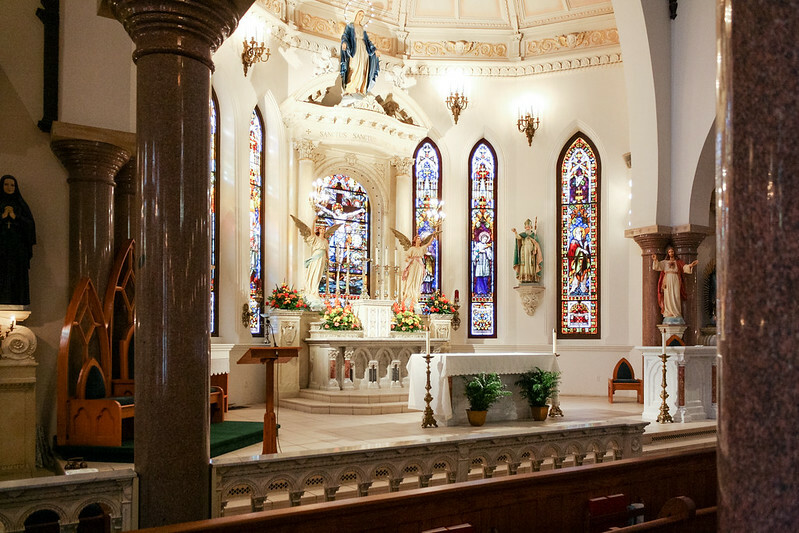 The Chapel provides a peaceful place where the youth can let down their walls and where they can surrender and relinquish control of their lives to a higher power that will not abandon them, will not abuse them, will not judge them, but will love them no matter what, and forever. 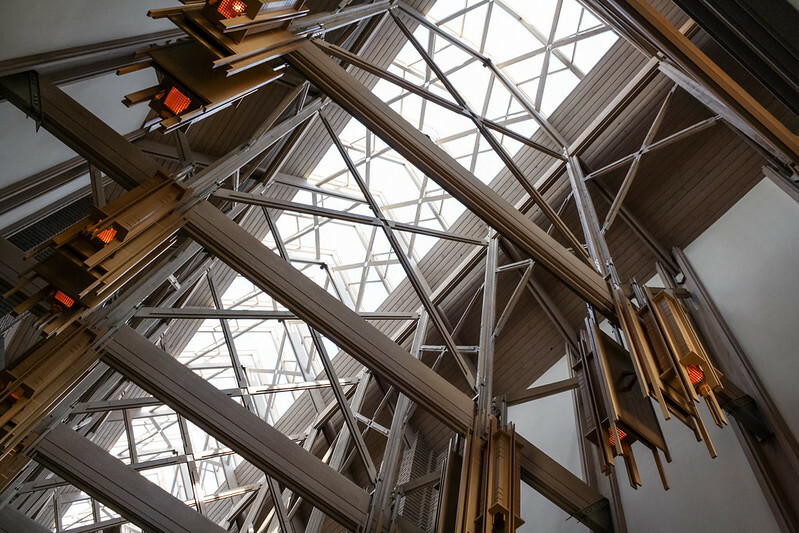 This interfaith chapel provides an uplifting environment that inspires people to think their highest and best thoughts. It is a place for worship, inspiration, prayer, guidance, celebration, joy, meditation, hope, relaxation, research, education, music, and spiritual enrichment. Which is not to say that Jones was not a designer in his own right. 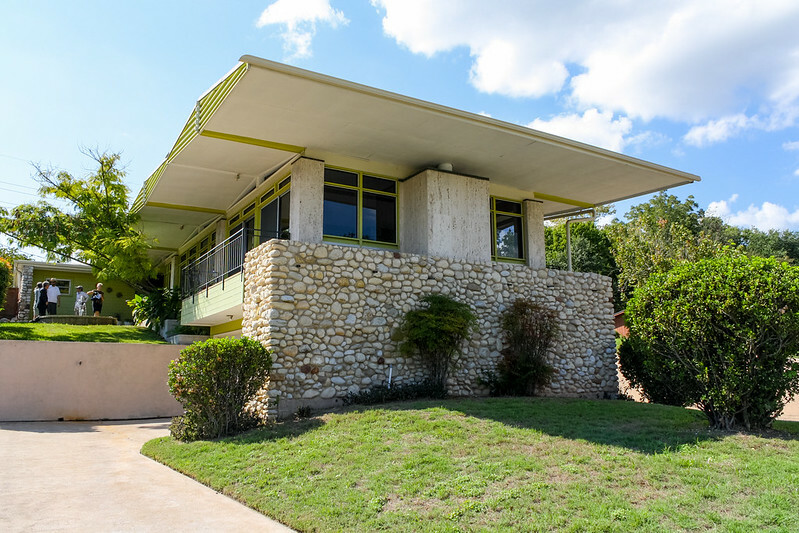 He developed a unique interpretation endemic to the Ozark forests that was an analog to Wright's prairie architecture rooted in the midwest or his desert architecture based out of Taliesen west. Moreover, Fay Jones was an extremely well regarded professional, as a Fellow of the AIA and recipient of the AIA Gold Medal in 1990, an well as an influential educator. The University of Arkansas named their School of Architecture in his honor after his death. 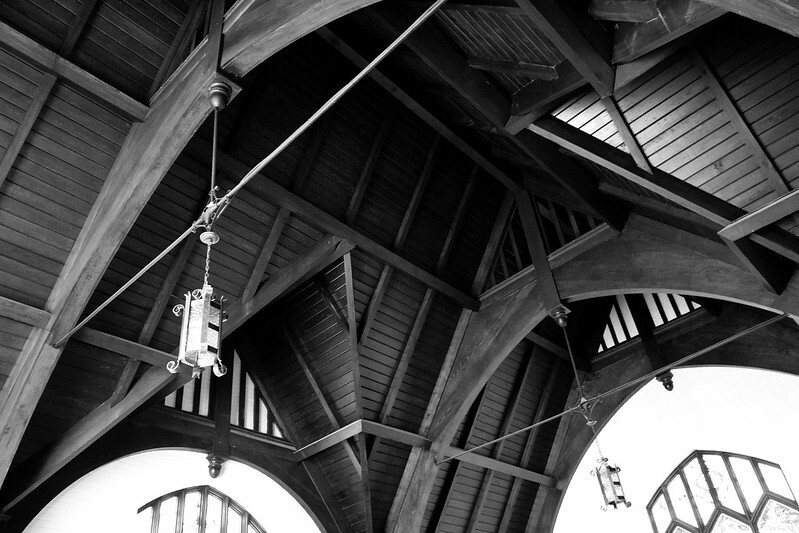 The timber filigree structure was the chapel's distinguishing characteristic and one that was evident from photographs. And it was indeed impressive, but in person the spatial sequence was the most interesting aspect as it moved from the dramatically vertical façade, through a low narthex, and into an open worship space. Compared to the initial impression of strong verticality add the linearity of the tectonics (along with the Thorncrown precedent), the broad central character of the nave was unexpected. 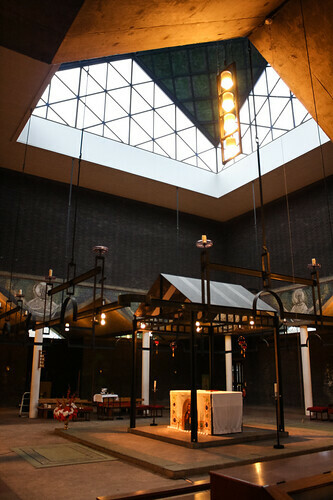 The entry space with service facilities is unusual among Fay Jones chapels; he typically preferred to use outbuildings for restrooms and other program requirements in order to maintain the architectural purity of the chapel itself. 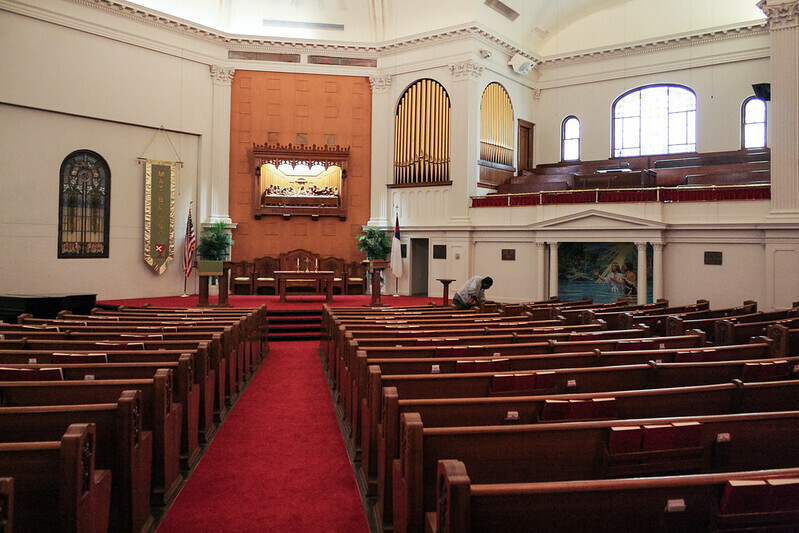 But the Leonard Chapel includes a full lower floor with a meeting room, office, kitchen, and restrooms. 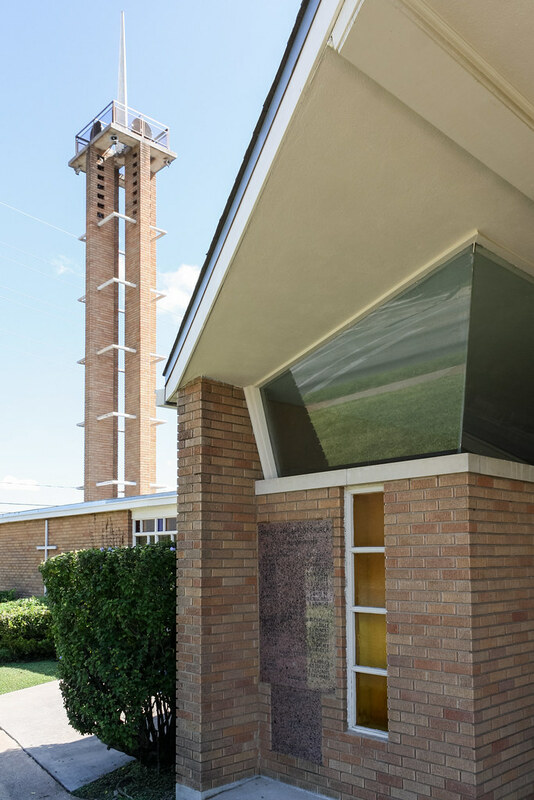 While Thorncrown may be the more pristine formal Architectural experience, the missional program of this chapel and the spatial complexity it required results in a more complete architectural work. View the complete photo set of the Marty Leonard Community Chapel on flickr. Our last stop on the tour was a small cemetery chapel in desperate need of preservation. Oakwood Cemetery was described as the burial place of the "notable and notorious" of Fort Worth. 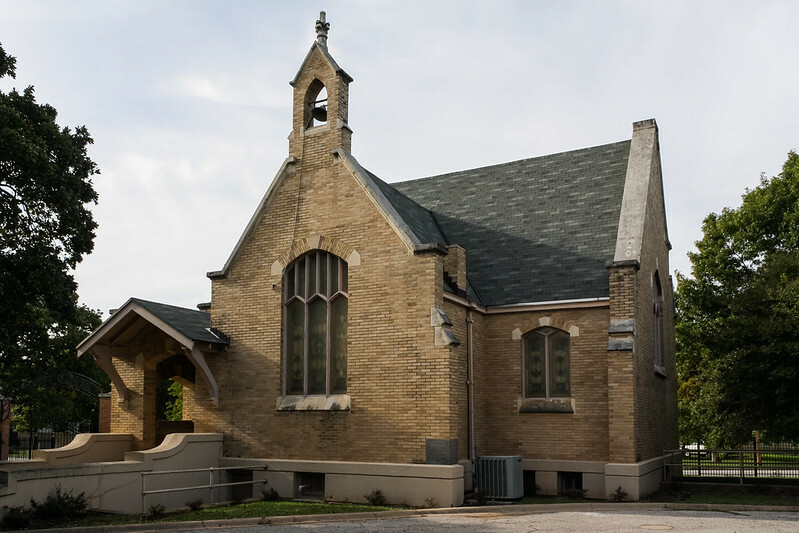 A group of women raised the funds to build the chapel in 1912. Architects Marion Waller and E Stanely Field provided the design. The timber roof structure in the small chapel was exquisite. We were also able to visit the basement of the chapel which at one time housed one of the first mechanical coffin lifts. 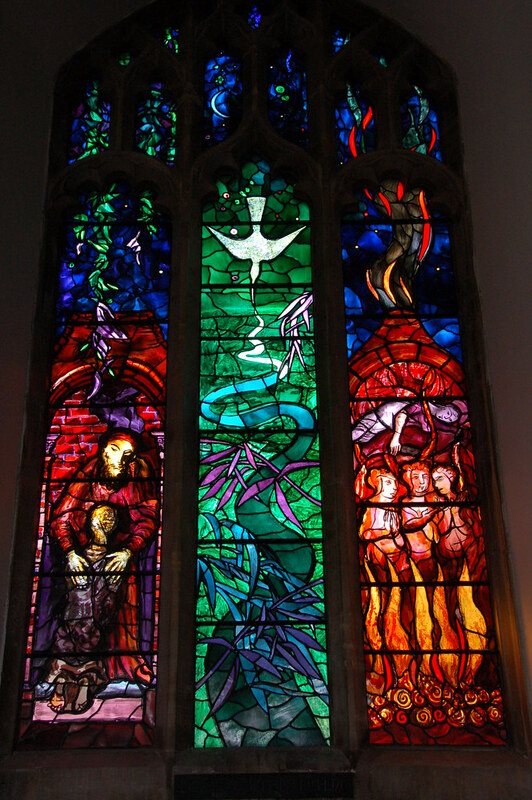 View the complete photoset of Oakwood Memorial Chapel on flickr. The next two churches were not part of the tour, but visited during some free time during the convention. Walking back from breakfast Saturday morning, I saw a dome across a parking lot that merited investigation. 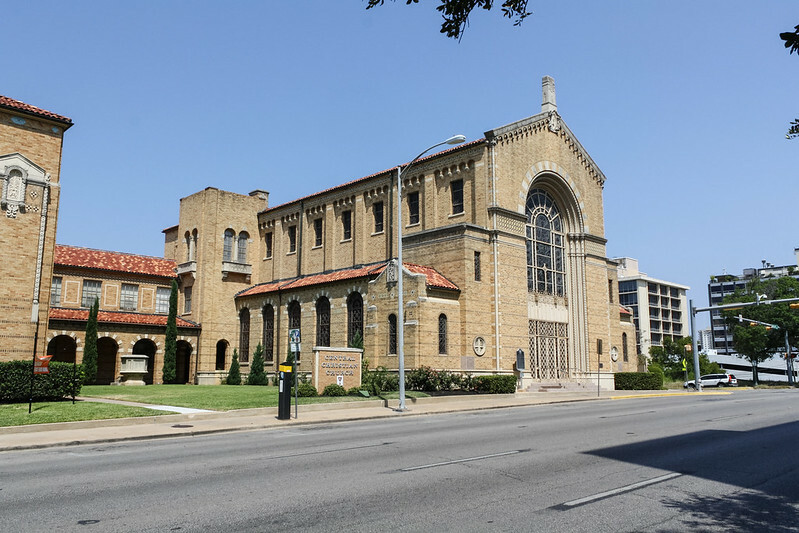 The building turned out to be First Christian Church, the 1914 neoclassical home of the oldest continually operating congregation in Fort Worth. The architects were E.W. Van Slyke and Clyde Woodruff. The interior revealed a quarter-radius auditorium about a corner sanctuary. This was an unusual arrangement, given the asymmetry of the choir loft over the baptistry, the interior stained glass opposite, and other irregularities. 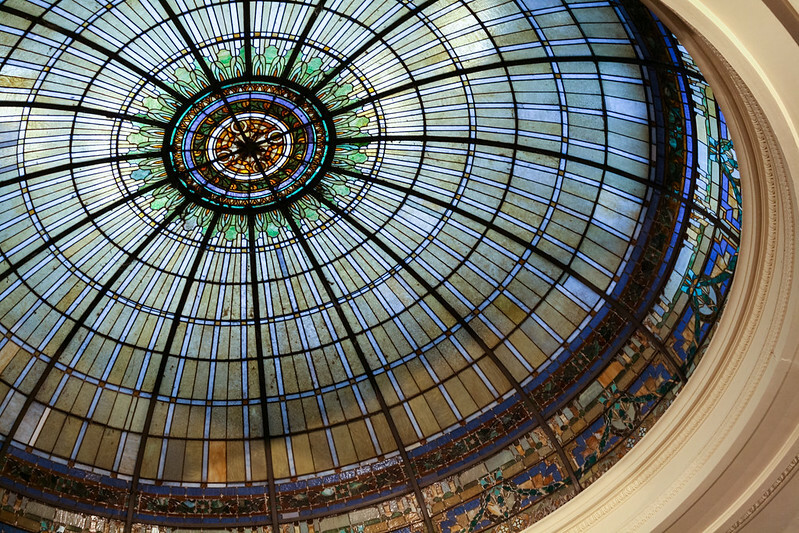 The dominant feature of the main worship space was a large domed skylight of stained glass centered over the nave. View the complete photo set of First Christian Church, Fort Worth on flickr. 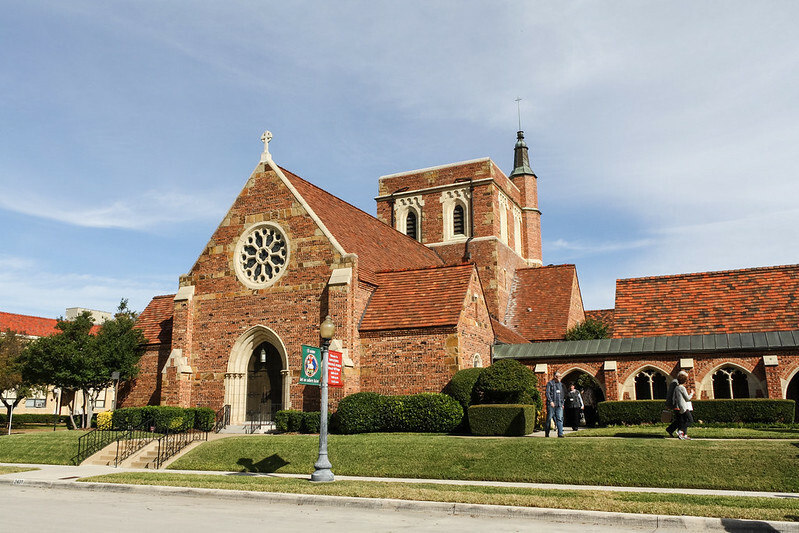 St Patrick Church started out as the first parish church in Fort Worth in 1888. 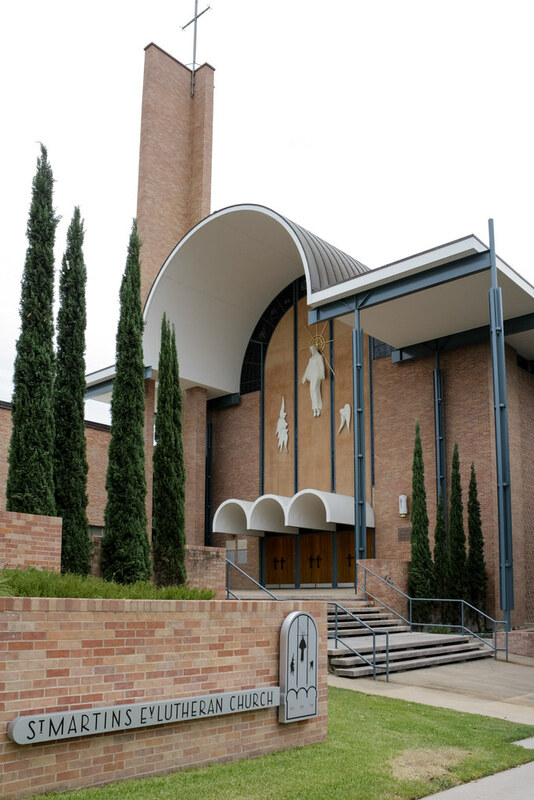 It was later elevated to co-cathedral of the Diocese of Dallas-Fort Worth in 1953. 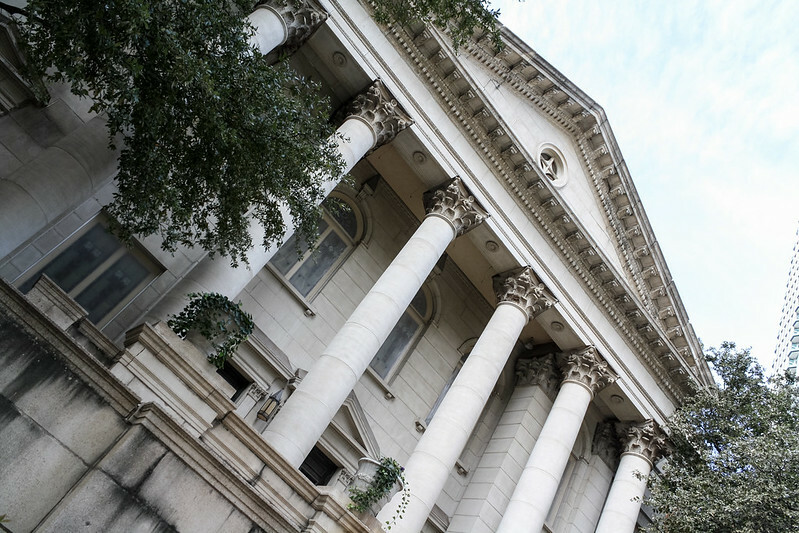 It has served as the Cathedral of the Diocese of Fort Worth since its establishment in 1869. 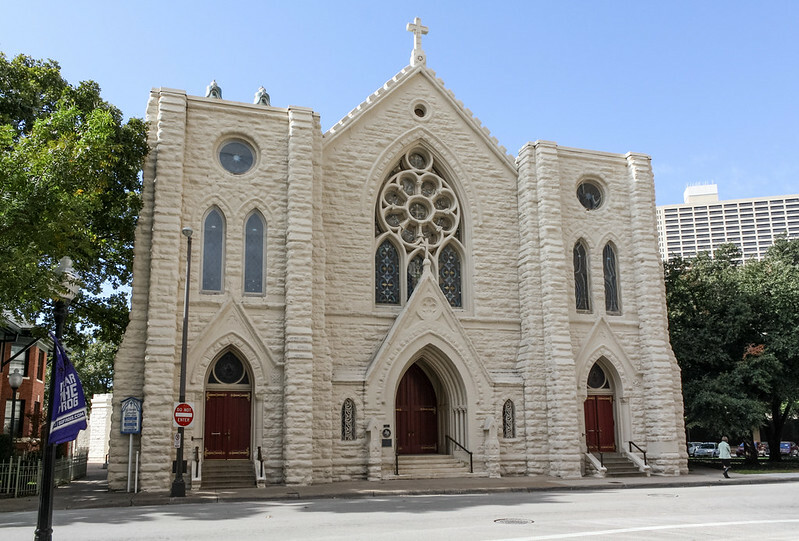 Architecturally, the structure was the Gothic Revival typical of large Catholic churches in 19th century Texas. But the ornamentation and especially the sanctuary were given a more Renaissance treatment. The result is the kind of indiscriminate traditionalism that feeds sentimentality. All three altar pieces are topped with broken round pediments, emblems of Renaissance absurdism. View the complete photo set of St Patrick, Fort Worth on flickr. From a visit to one of the Painted Churches of Texas: a magnificently restored Romanesque Revival in the German Catholic town of Lindsay. Recta final de l'obra mestra de Gaudí. This video has been making the rounds this week on everything from The Atlantic Cities to Gizmodo to HuffPo. Since I've posted on the Basilica and Expiatory Temple of the Holy Family (Basílica i Temple Expiatori de la Sagrada Família) in the past (on the occasion of its consecration), and I'm going to feature it in a lecture in the spring, it's worth sharing again. So there it is! La Sagrada Familia rendered as complete, c. 2026. The descriptions were always grand, but it is even more complex and massive than I expected. The video is very well made, building up each pice to reveal the underlying structure before showing the end result. Of course many of the outlets covering the video release refer to the building as "cathedral," but we all know better than that. Almost all of them refer to the building as "Gaudí's masterpiece," an epithet that is at least an over-simplification. Architecture as a whole has suffered from the insistence on the ideal of the individual artistic genius, and particularly so in this case. No substantial architectural work is ever the work on an individual; the common practice of referring to individuals as their authors marginalizes the work of many and establishes unhealthy expectations of the nature of the work. In the particular case of La Sagrada Familia, even during Gaudí's tenure, he worked closely with the sculptors and craftsmen on the individual elements. This does not detract from Antonio Gaudí's work, which went even far beyond the typical roles of the architect. His attitude towards this project was more monastic—as it embodied the evangelical counsels—than the obsessive artistic narrative more commonly cited. And of course since Gaudí's death, the task of completing the basilica has fallen to many different artists and craftspeople using a wide range of techniques ancient and modern. The story of the ongoing work is at least as interesting as the original design. 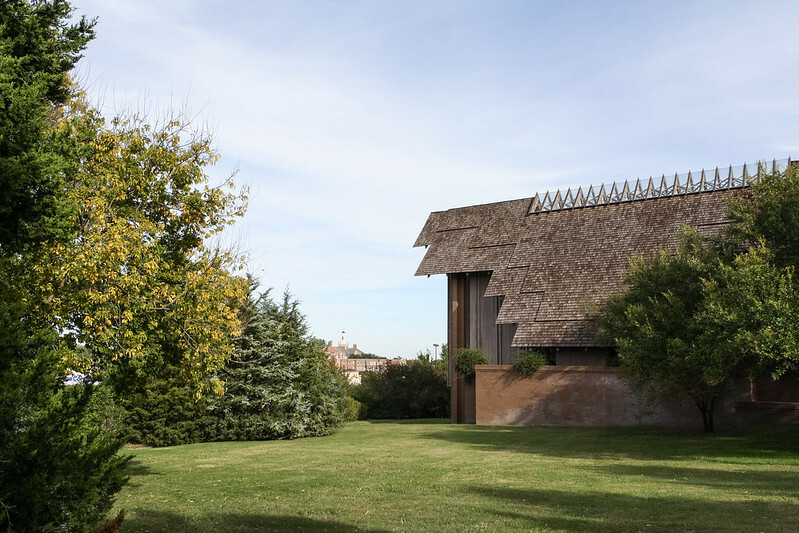 But perhaps the fact that a building started in the 1880s can be harmoniously and organically grown—and even be improved—by including some of the most cutting-edge digital generative/parametric and fabrication proves the genius of the design. Or at least its flexibility and resiliency, traits not shared by some of the more fussy, ego- and fashion-driven pavilions. One of our patrons celebrates his feast today: St Bernard of Clairvaux. Here's how Watts & Co marked the day, with a post of a Pugin Cistercian church at Abbey of Mount St. Bernard in Leicestershire. And yet he is responsible for one of the richest traditions of architecture in the history of the church in substance.